Once a bustling Gold Rush town of which little remains, Fair Play today is home to a beautiful rural wine country boasting of 25 award winning wineries, four B&Bs, unique eateries and family farms all surrounded by the oak and pine forests of the upper Sierra Foothills. Not a traffic-light to be found, just friendly hardworking people who have open their hearts and doors to visitors from around the world. 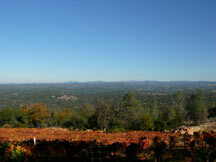 Located 12 miles southeast of Placerville and 15 miles east of Plymouth off Mount Aukum Road (E16).